Most aircraft still remaining by 2001 were destroyed by coalition forces in Operation Enduring Freedom. What was left of the Afghan Air Force was a few dozen pilots, most of whom had not flown since 1996, occupying a part of Bagram Air Base near Kabul. As part of the establishment of the Afghan National Security Forces (ANSF) in 2002, an Air Corps was subsequently established within the new Afghan National Army (ANA). Afghanistan required an air force of a modest size. Few would dispute the need for a transport capability, but some fighting power was also required if the Afghan National Army was expected to operate independently of US air support. Therefore, at some point, surely before the year 2020, a political decision would have to be made to invest in the reconstitution of an Afghan Air Force with a fighting capability. In the shorter term, the existing ANAAC, which suffered from ageing and antiquated equipment, required immediate investment merely to establish an air lift capacity. The ANAAC was in a very poor state as of late 2004. It lacked airworthy combat planes and possessed only a few attack helicopters. Airlift capabilities were very modest, with maybe 10 utility and attack helicopters and a few light transport planes at their disposal. Maintenance technicians were being trained, but no pilots. The Afghan National Army Air Corps relied on the vast pool of pilots who were trained during the communist period. More than 450 enlisted with the Afghan National Air Air Corps, but the majority of these serviceman had logged very few flying hours since 1990. By 2005, a force that once had 500 aircraft was reduced to only a few flyable craft. And just a small, though dedicated, group of pilots and maintenance people were left to keep the aircraft flying. Starting in a single small office with only three people, the Combined Security Transition Command - Afghanistan's Air Corps mission grew by mid-2007 to include more than 60 personnel. Forty-four former Afghan Air Force officers have also been hired as contractors to mentor the renewed Air Corps. The Afghans spent the past 18 months modernizing their force by upgrading their computer skills, logistics, maintenance and safety practices in order to modernize their force. Slowly, the minimum standards have risen. In 2008 NAVAIR’s Support and Commercial Derivative Aircraft Program Office, responding to a direct request from Afghanistan’s President and Minister of Defense via the Navy’s International Program Office, was directed to buy four Antonov AN-32 "Cline" aircraft for the Afghan National Army Air Corps (ANAAC) through the Foreign Military Sales program. The AN-32 is an all-weather transport aircraft that is ideally suited to flying missions in Afghanistan’s tough environment. It is widely used by commercial and military operators world-wide. The ANAAC had operated AN-32 aircraft without any logistical support since 1989. While the United States had said that it intended to rebuild the air force and various other states had made offers to donate equipment, no material aid had arrived by 2005. At that time essentially all air operations in Afghanistan were conducted by US and other allied aircraft. After an absence of nearly a decade, in 2009 the Afghan Mi-35 was again flying the skies of Afghanistan, thanks to pilots from the Afghan National Army Air Corps and the Czech Republic. On May 27, Afghan Mi-35 attack helicopters fired 12.7 mm rounds and 57 mm rockets near Bagram Air Base. Each partnered Afghan and Czech Republic crew fired 200 rounds of ball ammunition and 16 rockets while practicing gunnery on the East River Range Complex. The practice session was the culmination of more than a year’s work to rebuild the Mi-35 program, which gives the Afghan National Army dedicated, armed aircraft for the first time in eight years. The seven-hour training was supported by personnel and equipment from the ANAAC, the Czech Republic Operational Mentor and Liaison Team, Combined Security Transition Command - Afghanistan mentors and personnel from Task Force Thunder at Bagram Air Base. The Afghan air corps is building its own arming points and is working on an initiative to complete all its Mi-35 live-fire training at Afghan facilities, while the Kabul Military Training Center is developing standardized Mi-35 live-fire training procedures. The air corps also is researching live-fire training locations throughout Afghanistan to better integrate the Mi-35 with the army. All of the efforts are aimed at decreasing the time for an Mi-35 training flight from seven to three hours, effectively doubling the amount of live-fire sorties that can be accomplished in a day. The Mi-35’s combat radius permits it to conduct combat operations anywhere in the country. In 2008, the Department of Defense (DOD) initiated a program to provide 20 G222 (C-27A) to the Afghan Air Force (AAF). The G222s are twin propeller military transport aircraft built in Italy. The planes are known in the Air Force as the C-27A Spartan, though the Air Force no longer uses the planes. The planes are capable of delivering 10 tons of cargo, transporting vehicles and providing medical evacuation for 36 patients. The Italian-built planes are being purchased from Alenia North America and will be refurbished, with 16 to serve as medium tactical support transport aircraft and two others will get VIP configurations to serve as aircraft for the president of Afghanistan. The contract called for shipment to begin in September 2009 with deliveries to continue through 2011. 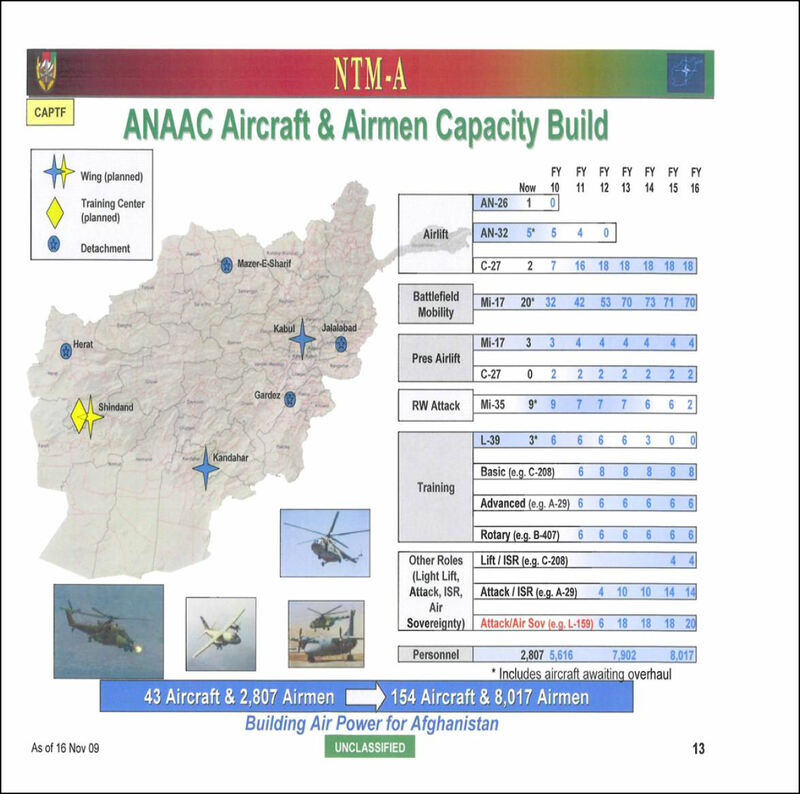 On January 31, 2013, the Department of Defense Inspector General (DODIG) reported that the G222 Project Management Office (PMO) and the North Atlantic Treaty Organization (NATO) Training Mission–Afghanistan/Combined Security Transition Command – Afghanistan (NTM-A/CSTC-A) did not properly manage the effort to obtain the spare parts needed to keep the aircraft flightworthy Despite spending $486.1 million on the program, DODIG reported that the aircraft flew only 234 of the 4,500 required hours from January through September 2012. The DODIG also concluded that an additional $200 million in Afghanistan Security Forces Funds might have to be spent on spare parts for the aircraft to meet operational requirements, noting that several critical spare parts for the aircraft were unavailable. 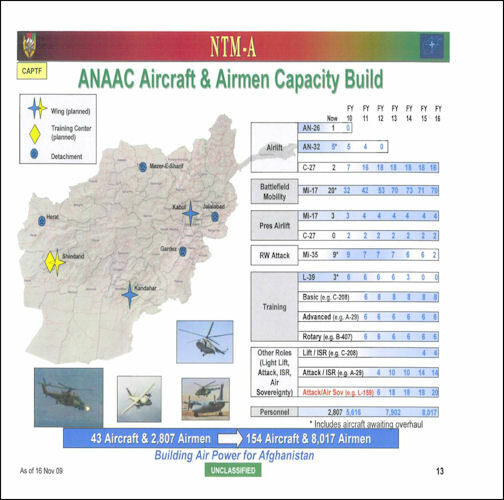 The ANAAC build plan as of 2010 included fifty-four Mi-17. Twenty of these were to be Mi-17v5. The Mi-17v5 is a dual role helicopter for both the movement of ground troops as well as gunand rocket pod capability to support those forces. There are political consequences to the procurement of Russian manufactured weapon systems. In addition, the precision of the Russian rocket pods is questionable when compared to United States manufactured rocket capability. There were also cultural consequences for the population conditioned to view Russian aircraft as part of an occupying force. While unable to go anywhere, anytime in Afghanistan, the large engines and increased altitude capability over similar United States manufactured products make these aircraft a good choice for the ANAAC. This helicopter, properly equipped with armament and trained aircrew, will greatly increase the effectiveness and initiative of the Afghan National Army. For the fixed wing side, the ANAAC structure contained provisions for fourteen Attack/ISR aircraft such as the Super Tucano and twenty Attack/Air Sovereignty aircraft such as the L-159 jet aircraft.